1 Is there baby swing that converts to high chair? 2 Is there baby swing with the detachable chair? 4 My baby loves sleeping in swing chair. Is it ok? 5 Is there baby swing chair for twins? Is there baby swing that converts to high chair? Yes, there are the baby swing chair and high chair combinations in the market. This adjustable chair grows with your child and has a big advantage – it will have a place in your home well even after your child is done needing a swing chair. The well-known Swing to High Chair from Fisher-Price with six speeds, many sound effects and songs is no longer available. This swing chair model (rocking chair) looks beautiful but it is very simple and without entertaining features. That means, the swinging motion is not motorized but it relies on good old-fashioned arm muscle power provided by the parents. 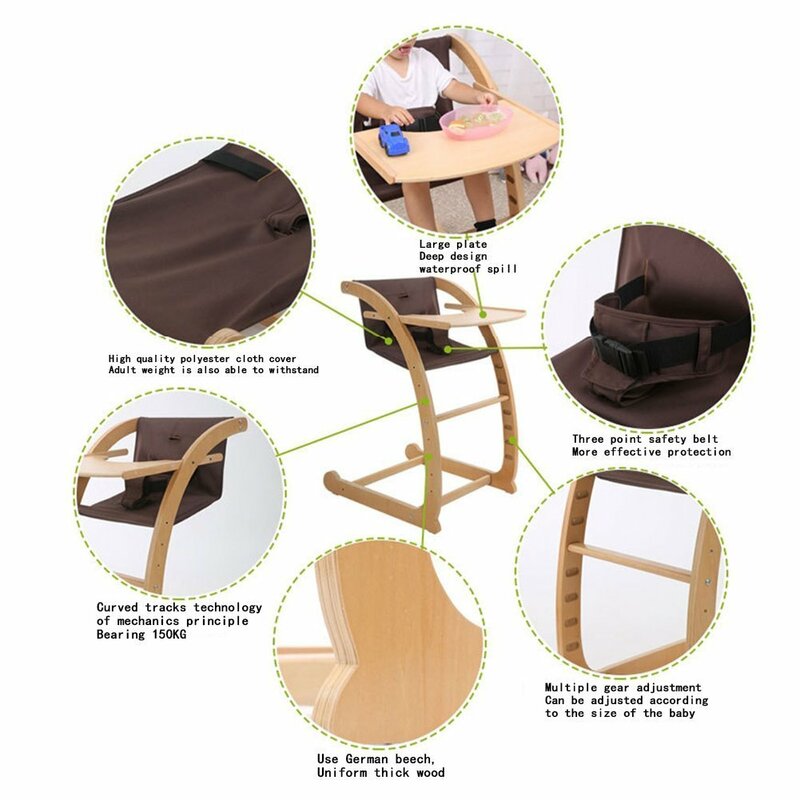 The good side is- it easily converts into a wooden high chair for 6month-3years old baby with a removable tray and three-point safety belt. And later it can be used as student or adult chair. The high-quality polyester cloth cover is easy to clean. Is there baby swing with the detachable chair? Parents prefer baby products that do more than one thing, so you’re sure to love this 2 in 1 model from Graco. This excellent product has a removable swing seat that can be used as a bouncer, so you’ll have two great ways to soothe your baby. Swing and Bouncer with Detachable Chair from Graco. Most experts recommend limiting your baby’s time in an automatic swing to 60 minutes or less a day. Sitting in a swing can avert your baby to develop the motor skills that will eventually lead to crawling, pulling up to stand, and cruising. It’s also important to hold and communicate with your baby as she matures physically and emotionally. So it’s okay to use the swing to soothe your little one, but the best way is old-fashioned and the most natural holding or swaddling. My baby loves sleeping in swing chair. Is it ok? It is fine if the rhythmic rocking motion helps your baby to fall asleep for a nap, but swings are not intended for sleep and is not meant to replace the child’s bed. It’s understandable: Your baby falls asleep in the swinging chair, and the last thing you want to do is risk waking him or her up with a move. But in its new recommendations to combat SIDS (sudden infant death syndrome), the American Academy of Pediatrics warns – sleeping too long in a sitting position may make it hard for a baby to breathe and get enough oxygen. Finally, carefully read the instruction manual for your baby’s swing before doing anything, and follow the manufacturer recommends. Is there baby swing chair for twins? No, there isn’t. We recommend buying only one baby swing chair.